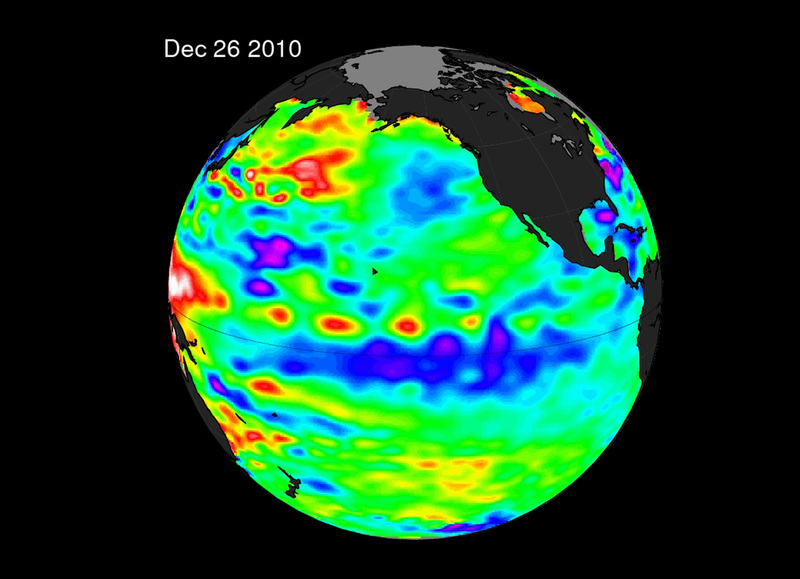 A new Ocean Surface Topography Mission (OSTM)/Jason-2 satellite image of the Pacific Ocean that averaged 10 days of data was just released from NASA. The image, centered on Dec. 26, 2010, was created at NASA’s Jet Propulsion Laboratory (JPL), Pasadena, Calif.
Earth’s ocean is the greatest influence on global climate. Only from space can we observe our vast ocean on a global scale and monitor critical changes in ocean currents and heat storage. 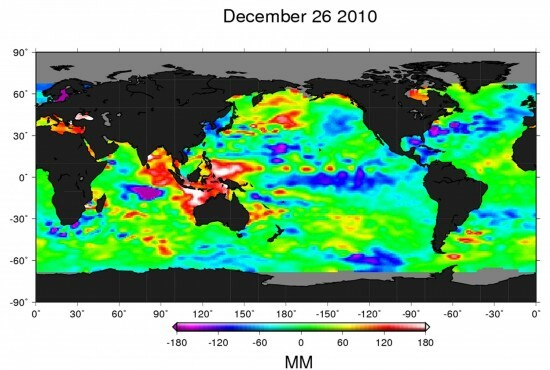 Continuous data from satellites like OSTM/Jason-2 help us understand and foresee the effects of ocean changes on our climate and on climate events such as La Niña and El Niño. The latest report from NOAA’s Climate Prediction Center (CPC) noted that “A moderate-to-strong La Niña continued during December 2010 as reflected by well below-average sea surface temperatures (SSTs) across the equatorial Pacific Ocean.” The CPC report said that La Niña is expected to continue well into the Northern Hemisphere spring 2011.